Have you come across the term “record shots”? These can be quite good photographs, but the images are given to the photographer, not made by the photographer. Classic examples of record shots can be seen in photo competitions where there is always more than one shot of fungi in the forest. The photographer then labels these as “Fungi 1”, “Fungi 2” and “Fungi 3” and onwards. Quite spectacular colors with reds and whites predominant. But these are record shots because all the photographer did was trip the shutter. So how do you escape from the traps of Fungi 1? The first thing to do is to sit down and plan your shots. For example, if you want to take a shot of a waterfall – the record shot approach is to include the signpost Niagara Falls, with the water in the background. So you have a photo of a waterfall and the place was Niagara Falls. Your Aunt might like it. The creative approach is to acknowledge that you can’t get the signpost and the water in the one shot and take them singly, putting some thought into how to do it. You see, photography isn’t just recording things/events. Photography is part of the creative arts, and creativity is something that you can learn. I want you to get hold of a book, written in 1981, so now well out of date but try Amazon and go from there. 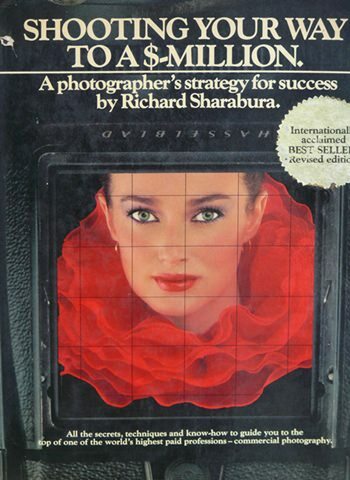 It is called “Shooting your way to a $-Million” and was written by Richard Sharabura. It was my ‘bible’ in my early career and is the most comprehensive “How To” book ever. He states (correctly) that if you study the work of the great photographers – Avedon, Penn and Turner – it becomes apparent that it is not what they shoot, but how they shoot it that makes their work so memorable. For example, Chapter 6 covers how to take great photographs, professional techniques and ideas. Subjects include fashion accessories, lingerie, glamor, jewelry, liquor, food, room sets, TV’s and appliances and how much equipment do you really need. Although the section on cameras dates the book as pre-digital, the items he writes about are really timeless. Like double-sided tape, hypodermic needles for squeezing bubble into a glass of wine for example, rubber cement, six reflector cards (white, black and silver), and other natty ideas to help you raise your photographs above record shots. As you become more advanced in photography you will be able to produce photographs that have your creativity in them, getting you right away from the record shot problem. One item that he does not mention (an oversight I am sure) is a notebook and pen. Once you have managed to get the shot you want, the notebook allows you to duplicate that shot next time. This is the quickest way to learn, and photography really is a learning process. Record shots are not! That is enough for you to get some enthusiasm for the art of photography, and again, it may be an old edition, but Sharabura’s book is the best teacher you will ever have. There are three dimensions – not two!